We are moving him from the box room to the spare room to give him more space to play. We are keeping the nautical theme, as he has so many lovely accessories I have collected over the last 3 years, but adding a few little things including my home made 'Get Knotted' board! I used a flat canvas board as opposed to a boxed version you can buy, as it was more sturdy. Lightly draw in pencil your chosen word. Their name or initial would work well too. Leave more room at the bottom of the board for your dangly bits to hang down. Cut your rope into strips roughly between 30 and 50cm long. You can always snip a bit off the bottom at the end but you can't add them! 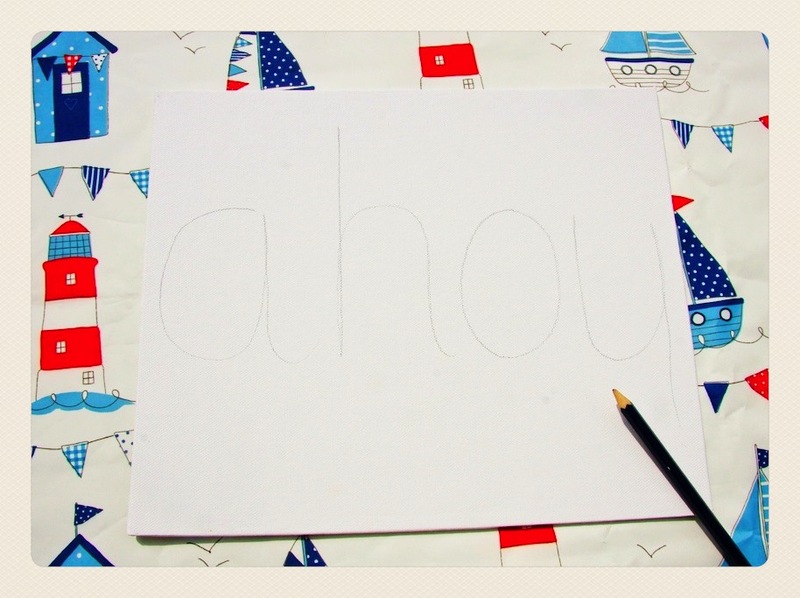 Use a glue gun or strong super glue to trace each letter, one at a time. Place your strips of rope on the glue letter and press down firmly. If possible use a single strip for each letter. The 'h' and 'y' needed two strips and I decided to leave the 'o' just as a letter. Leave enough rope dangling down on your chosen letter to be able to tie a bow. Turn your board over and glue the picture hook plates, so the board will lie flat against the wall when hung. You can get these in any DIY store. I had an anchor wall sticker left over so I added it to the corner for some extra detail! The finished article on the wall for our big boy to learn and enjoy! I just need to learn some knots myself so I can play with him!